Description of "Widening Horizons for Educating the Gifted and General Education (eBook)"
Dr. Sujatha A. Krishna Rao, author of ‘Widening Horizons for Educating the Gifted and General Education’, is an educational and corporate training consultant with a diverse background in psychology, education and management. She offers an enlarged and revised edition of ‘Widening Horizons’ as an eye-opening and inspiring guidebook for educators worldwide – school teachers, teacher educators, researchers, educational policy makers and administrators, and given its simple and lucid style, also parents. The book examines vital issues that are relevant not only for ‘education of the gifted’ but also for ‘education in general’ and ‘broadens horizons’ regarding both. 200 out of every 1000 children (who together constitute children who are in the top 10% of their age group on any ability) are gifted in some important way and can make outstanding contributions in various fields. But because most schools focus on the ‘average’ child, the rights and needs of gifted children are ignored, resulting in failure to identify, understand and nurture their talents adequately. As a result, by the time these children leave school much of their talents are lost, often irrevocably, both to themselves and to society. In this enlightening book, Dr. Rao examines comprehensively and in depth the myriad aspects of gifted child education. She also critiques in Chapter 6 gifted programs in her own native India. This serves as an in-depth example, of global value, of what schools are doing in theory and practice to address the educational needs of the gifted. Also very importantly, this critique has been made against the backdrop of ‘education in general’ and the views on education of Indian seer/mystic/spiritual philosophers. This brings to the fore some serious, fundamental lacunae in educational systems all over the world which have led to the lop-sided development of both individuals and societies. This illuminating critique takes the book beyond the boundaries of ‘education for the gifted’ to ‘education in general’ and ‘widens horizons’ regarding both. Dr. Sujatha A. Krishna Rao, has a diverse educational background spanning management, psychology and education. She obtained a Bachelor’s degree in Commerce and a Master’s in Business Administration from Osmania University, Hyderabad, India. She then pursued a course of studies at the University of Oxford, U. K., leading to award of the Special Diploma in Educational Studies. Following upon this, she pursued research in the area of ‘Creativity in the Sciences’ and was awarded a Ph.D. degree in Psychology in 1983, by Sri Venkateswara University, Tirupati, for her thesis titled ‘Problem Classification, Problem Genesis and Problem Definition in the Sciences’. She pursued further post-doctoral research in the same area, for 1 year at the Centre of Advanced Study in Education, M. S. University of Baroda, and 3 years at the Department of Psychology, Osmania University. Dr. A. K. Sujatha served as a faculty member from 1988-90 at the Jnana Prabodhini Institute of Psychology, Pune. She is presently an educational and corporate consultant, and specializes in conducting training programs for educational institutions, corporate houses, research and development units, governments and the general public. 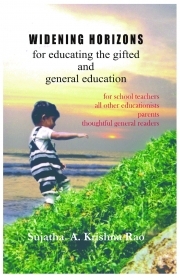 Reviews of "Widening Horizons for Educating the Gifted and General Education (eBook)"